Lauten Audio has almost completed its Eden project. MUSIKMESSE 2015: Lauten Audio has taken the wraps off Eden, the new 'multi-voice' vaccum tube mic that it'll be showing in Frankfurt this week. 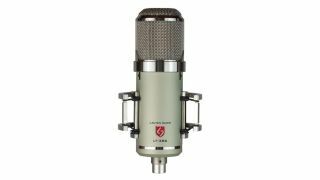 Also known as the LT-386, the new mic is designed for those seeking a "diverse and useful modern vacuum tube microphone". A switch enables you to select different timbre settings, and you can also choose from three polar patterns and make use of a high-pass filter. Tonally, we're promised a "smooth and rich character". That character won't come cheap, mind: Eden will have a list price of $3,999 when it ships in June. You can find out more on the Lauten Audio website.